To automate the construction of a composite fuselage shell for the Airbus A350 XWB. Traditionally this kind of work has always been done manually given the challenging nature of working with carbon fibre resins. To develop an automated manufacturing cell in which stringers to reinforce the fuselage are positioned and bonded into place. FANUC robots with extended reaches and higher payload capacities were required for this work, given the dimensions of the seven-metre-long hull section to be reinforced. Automating this awkward high-precision process has shown that robots are capable of providing the exacting degrees of accuracy demanded by these processes. Building the cell proved that this process was both technologically and economically achievable. The technology center Nordenham is the birthplace of a new production technology. Along with Premium Aerotec FFT EDAG developed an automated manufacturing cell for the positioning of stringers for CFRP fuselage parts. The production cell is going to be used for production of the Airbus A350 XWB. The production of the new Airbus aircraft is currently starting and the first aircraft is in the final assembly stage. The production facilities are being improved, especially the degree of automation is to be extended. The new aircraft, both the wings and the structure of the hull are manufactured in carbon fiber composites technology. Production facilities will be developed jointly by the EADS subsidiary Premium Aerotec and FFT EDAG. These two companies have been rented space in the new technology center Nordenham. Premium Aerotec have specialized on the construction of aircraft structural components. The required production facilities are operated by Premium Aerotec and enhanced. FFT EDAG supplies many industries, particularly the automotive and aerospace industries with readymade solutions for mass and batch production and turnkey production lines. The company is recognized on the global market as the largest independent development company. The opportunity to introduce new technologies into aerospace has not always been available. This is easy to understand: For security reasons traditional practices involving manual labor are often preferred. If now there a fundamental change in the materials used, new production methods are essential. In order to produce with reproducible top quality and competitive costs, the question is not whether but only how to automate the production. So far, the construction of a composite fuselage shell still requires a lot of manual work. The first production cell is to demonstrate that the manual setting of the stringers can be automated. The principle is known: Carbon fiber pre-impregnated with resin, so-called Prepreg, is placed into a mold, one above the other and depending on the required wall thickness several layers. The composite parts are hardened by "baking", so they are heated in an oven under pressure at about 180 ° C and hardened. In order to achieve the required rigidity for an aircraft fuselage, longitudinally additional braces so-called stringers are inserted into the prefabricated shell, which already has the shape of the fuselage. As this process takes place prior to curing, this phase is called "wet material". The automation of these steps has to overcome some obstacles. It is very difficult to transfer knowhow from other processes. In the end high-precision aircraft structures are to be assembled from large, not very rigid parts. At the same time the automation should convince the aviation industry not only by technically but also economically. As in the automotive production a platform strategy promises a maximum of flexibility with regards to the automation requirements. Mike Wehn, project manager of FFT EDAG Nordenham, remembers the development of specifications: "Flexible programmable robots shall replace inflexible large fixtures." The result to be found in the technology center Nordenham now is the first actual production cell. It is tested with a component that is already about half as large as the original. In the seven-meter-long hull part a total of 16 stringers are inserted. 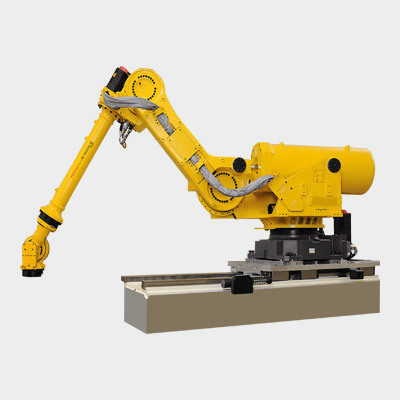 Both FANUC robots in the test cell are equipped with long reaching arms. The robot model R-2000iB/100P has a maximum reach of 3,500 mm. One of the two robots is mounted on the floor. The robot holding the tool head is mounted on a rail unit. 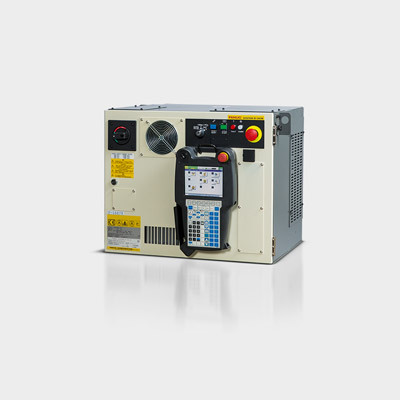 The FANUC robot controller R-30iA controls all axes. A total of 17 axes are connected, two robot arms with six axes each, a rail unit and another four axes of the processing head. Furthermore, several actuators are installed in the head, which are integrated via Profibus with the robot controller. Wehn: "The highlight of the robot head are the four integrated FANUC servo motors." These servo motors allow the side parts to adjust to each other, so that you can adapt the head to different geometries. The idea is to use off-line programs not only for simulation but also to directly transferred offline data into production programs and to work with the values that come from for example RobCAD or Catia. Wehn, "We will save manual adjustments to the head, because the servo motors adjust themselves automatically for each program." At this stage, the FFT EDAG developers have taken into account the different shells by Premium Aerotec. Originally each of these forms required a separate tool for precise positional placement of the stringers. This specially developed, so-called roll-bonding head is designed so that only a single tool is required. But not only for the future production the adjustment by servo motors has its benefits. Even during the design phase of the cell there are changes again and again. In general, the development plans in many areas are not exactly nailed down, as Wehn says: "We are working with Aerotec to develop a production system, as it could be in a future actual production - including aspects of space usage and including the logistics." FFT EDAG would not be FFT EDAG, would this development not trigger the next one. Because in order to increase the added value in the production system for laying the stringers they are working at a project to lay non-woven sheets or other auxiliary materials which are inserted between the stringers. And also the next step should be automated: the application of a film, which covers the stringers and auxiliary materials. "Very important," says Mike Wehn is the motion profile of the robot. The R 2000iB robots used have to pick up the parallel stringers provided aligned in parallel with the mold, lift them in a flip over motion and then place them with a millimeter precision inside the mold. What is currently is being tested with only two robots could soon take on large dimensions: Then there will 4 robots on each long side of the mold handling up to 18m long stringers. This requires precision but even more synchronization of the movement. Using conventional programming this would be a difficult undertaking. “Thanks to the multiarm feature this is very comfortable to teach" says Mike Wehn about the robot teaching operations. The sequence looks like that the robots pick up a stringer each, then by a flip over motion transfer it into the mold and hold it a few centimeters above the material surface. Any uncontrolled swinging of the stringers must be prevented by all means. As with the bonding of a long strip of cellotape one end of the stringer will then be placed on the surface exactly by the head. Slowly the robot moves with the so-called roll-bonding head along the rail axis until the entire stringers are inserted. In this manner the stringer can be inserted largely without any reactive force. Mike Wehn explains why even the inserting should be done without any force or tension: "During positioning we must achieve an accuracy of plus / minus three tenths of a millimeter." Wehn: "Our task was, among other things, to demonstrate that we can automate this positioning in a highly repeatable accurate and stable manner." In order to ensure the absolute accuracy over the entire work area of 18 x 3.5 meters for the whole process a Leica system was added that measures the robot during its motion across the stringers near the TCP and corrects deviations occurring by adjusting the 3D model.